by David Craig. Born in 1948 in Co. Kildare, David has been associated with horses since an early age. In 1978 he was encouraged by a local horse trainer to begin painting. 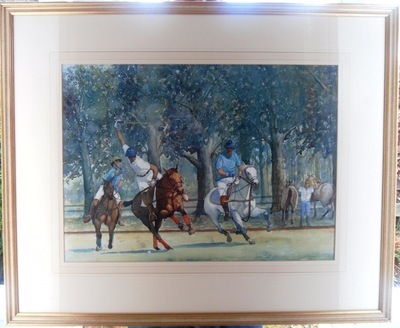 Numerous racehorse owners have commissioned work from him. His polo pictures are quite rare although he has decorated the polo room at the Edwardian Hotel near London. Image size 60cms x 45cms approx. In gilt frame.